Unsatisfied with the shortness of my trip (!!) on the 30th August I decided to head North and fly out of Lima in completely the wrong direction. The Amazon jungle is a significant part of the South American continent so I had felt uncomfortable about the idea of skipping it. The seed had been sown when passing the turn off in Pedro Ruiz (near Chachapoyas) a couple of months earlier and the predictable FOMO started to set in. Cheap (ish) flights and an invitation to share the trip with a cute Dutch companion (female I might add), the decision was made in about 10 seconds whilst munching on a rather dull ‘almuerzo’ in Lima. Quick digression: with travelling, the less you plan, the richer the experience (in my opinion). A few key plans are important but after that you’re quite possibly just wasting time. For example, endlessly checking for the best hotel through tripadvisor is not guaranteed to satisfy you. Aside from reducing the chance of serendipity, a popular place is often over-valued and recommendations are sometimes exaggerated / utterly false. Since tripadvisor makes the place so popular, you may end up with the worst room in the hotel. Then again it may work out but both methods contain a fair amount of chance, why not go with the one that requires less work? Often a vague plan works out amazingly well. Route: ignore elevation profile, obviously slightly superfluous here although look how flat it is. Check the waypoints for travel info. 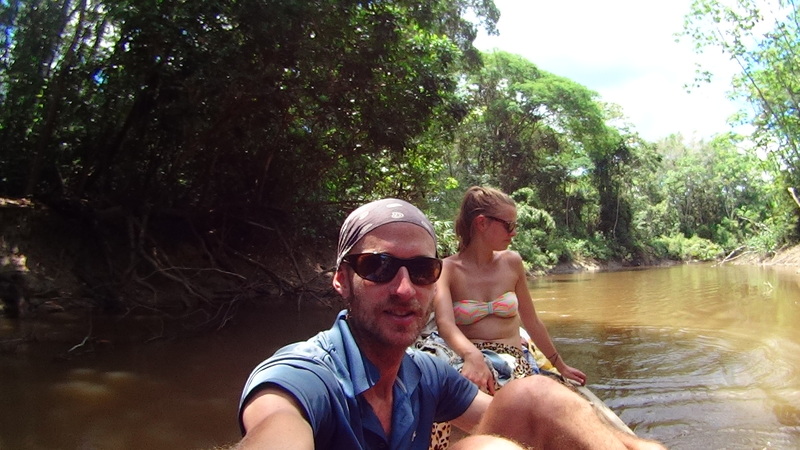 And so with a deliberately vague one week plan to ‘go into the jungle’ (that’s the way we both like to roll), we started in Tarapoto, traversed a large portion of the jungle by boat and finished in Iquitos. By the end we had clocked up a staggering 19 days. What were we doing? For 5 days we were paddled into the jungle by guides down the Rio Samiria and for another week we took part in a retreat (near Iquitos) involving the famous and somewhat bizarre ayahuasca ‘medicine’. Personally I found few obvious benefits, developing my vomiting and diarrhoea skills seemed to be the main highlight although others had some pretty profound mental revelations (more on this in the next post). From Lagunas, our guides paddled us into the huge and beautiful Pacaya-Samiria reserve where we stayed in cabins situated every 5 or 10 kms along the Rio Samiria, spear and line fishing (priranhas) for dinner. The diversity of different plants and animals roaming free was impressive. I found myself getting restless and slightly bored just sitting in the canoe so at times I joined in the paddling. 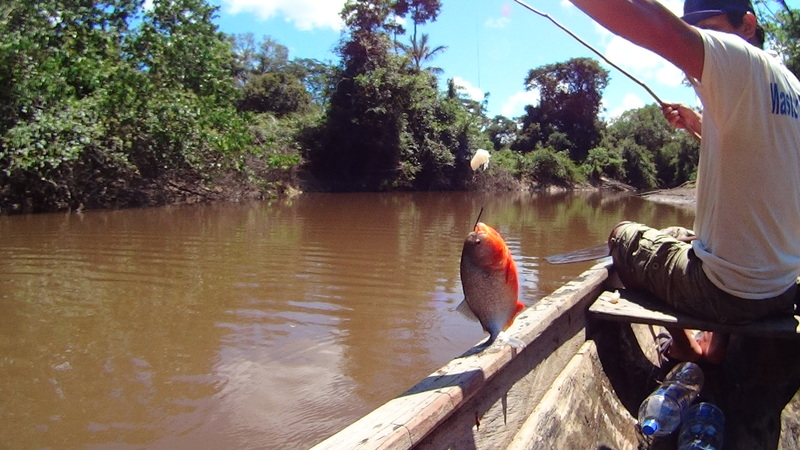 Line fishing for Piranha. With almost zero skill we both managed to catch a couple. Cabin accommodation. Basic but sufficient. Looking after each of the cabins, rangers try to prevent illegal interference with wildlife such as collecting turtle eggs to sell. Previously they struggled to control these activities and occasionally people were killed trying to enforce this law. Locals fought dirty and believed they were entitled to these types of ‘resources’ having hunted them for many previous years. In an attempt to control this situation the governing body decided to turn the obstacle on its head and give certain limiting rights to the mercenaries. In return for these rights, they are required to patrol and look after certain areas. Amongst other things they can now sell a limited amount of turtle eggs (which are 1 sol (30USc)). Eating turtle eggs isn’t illegal in Peru even though the species is protected in some areas. The cabins have protected turtle nests with hundreds of turtle eggs rescued from the beaches of the river to increase their chances of survival to adulthood. Unfortunately once released, the turtles instinctively head downstream to lay their eggs in the areas ‘looked after’ by those with turtle egg ‘rights’. Sadly, the governing body of the park receives no benefit. Animals seen: sloths (high up in the trees), lobo rio (glan otter), monkeys, toucan, red piranhnas, paiche and others that I have ignorantly forgotten. Emergency water by slicing up a vine. Heading down a tributary of the Amazon river. This is actually a boat, not a bus. But it has actual bus seats which you can move around? Yes that’s right. 6 hours from Yurimaguas to Lagunas on the fast boat. And then after the jungle trip, 12 hours to Iquitos for some jungle medicine. And not the fun kind. 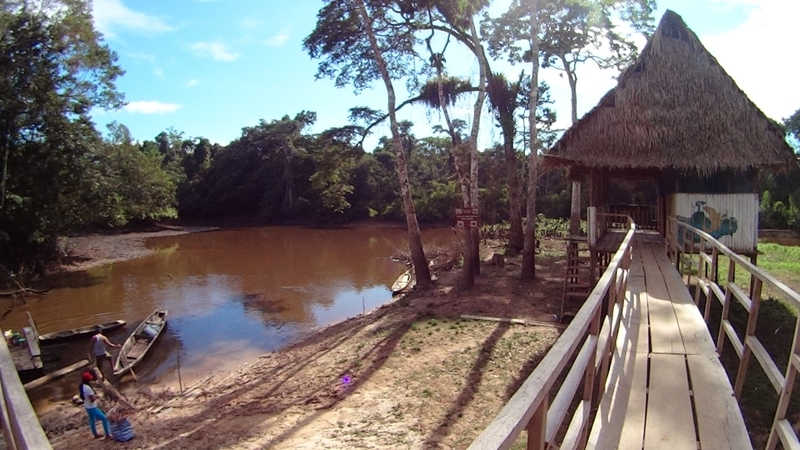 Lagunas is a much quieter and less touristic place to launch into the Amazon jungle than the loud and stifling Iquitos. 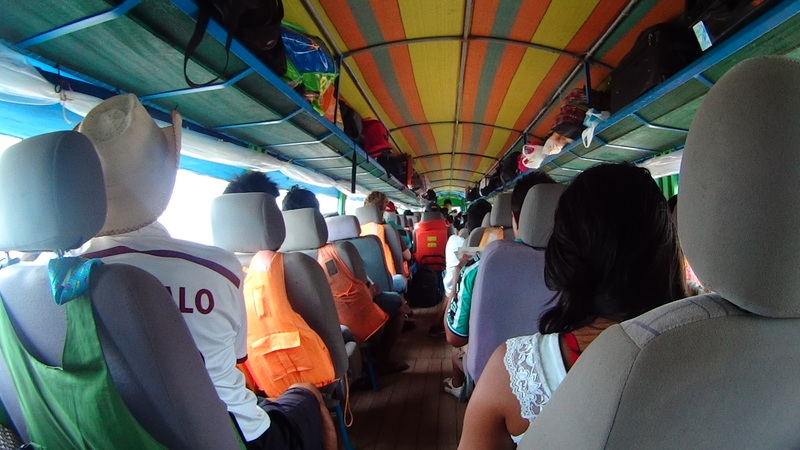 After a 20 sol / 2 hour colectivo car ride and a night in Yurimaguas, we boarded the 6 hour ‘fast’ boat to Lagunas (40 sol?). We were somewhat concerned after being told by the hostel that Lagunas was a tiny town and therefore impractical for setting up a jungle trip; “difficult to get food and supplies”. Predictably, this turned out to be a sales lie. On arrival in Lagunas we found the excellent Acatupel agency who provided us with top class better valued service. Our guide Javier was a great spirited fellow who really knew his stuff; he works only with Acatupel. I was sick the day we were supposed to leave and Acatupel were very helpful. Perhaps worth contacting them before getting to Lagunas (a couple of days before), on their website or through Facebook (here, be sure to be connected as a ‘friend’ or the message may not be received such is Facebook)). We extended from 4 to 5 days whilst in the jungle. It was a ‘down the river and back the same way’ trip. For those looking for a longer adventure, a 20 to 25 day trip across whole park is possible. Which could be interesting although, it would probably require some persuasion of the park to go without a guide if that’s your thing.